Heart, Myocardium - Necrosis in a male P16Ink4a/p19Arf (background: 80% C57BL/6, 19% 129/Sv, 1% SJL) mouse from an acute study. 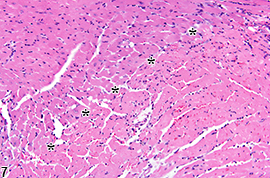 Myocardial necrosis (arrows) manifests as areas of pallor in the myocardium. Heart, Myocardium - Necrosis in a male P16Ink4a/p19Arf (background: 80% C57BL/6, 19% 129/Sv, 1% SJL) mouse from an acute study (higher magnification of Figure 1). Loss of cellular detail is apparent in the areas of pallor (arrows). 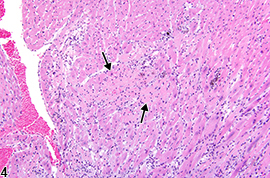 Heart, Myocardium - Necrosis in a male B6C3F1/N mouse from a subchronic study. 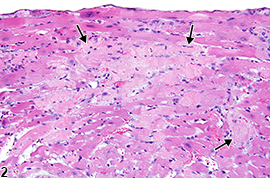 Areas in the myocardium show loss of cellular and nuclear detail (arrows). Heart, Myocardium - Necrosis in a male P16(ink4a)/(+/-)(C57BL/6) mouse from an acute study. The myocardium has coalescing areas with loss of cells (arrows). Heart, Myocardium - Necrosis in a male P16Ink4a/p19Arf (background: 80% C57BL/6, 19% 129/Sv, 1% SJL) mouse from an acute study (higher magnification of Figure 4). 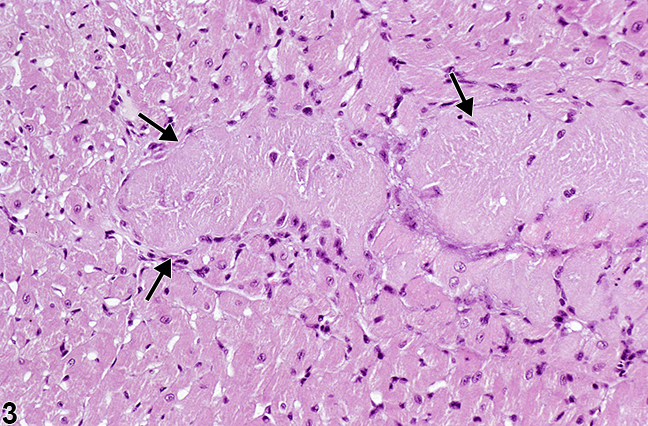 There is loss of cellular detail (arrows) and a small area of hemorrhage. Heart, Myocardium - Necrosis in a male B6C3F1/N mouse from a chronic study. 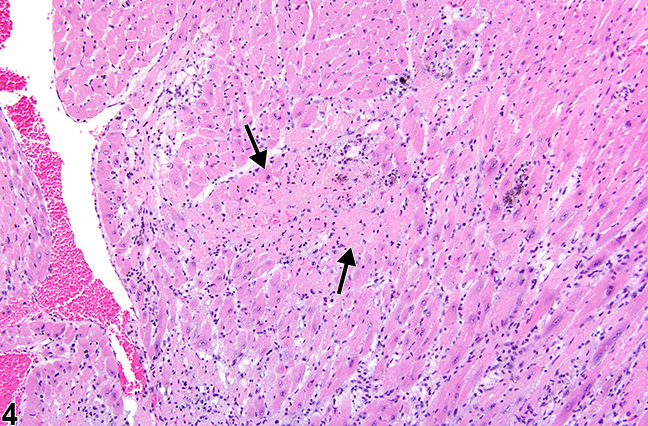 A well-demarcated region of myocardial necrosis (infarct) is present in the interventricular septum (arrows). 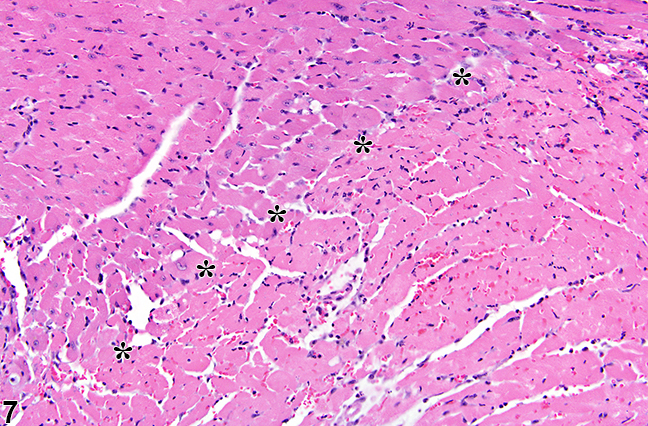 Heart, Myocardium - Necrosis in a male B6C3F1/N mouse from a chronic study (higher magnification of Figure 6). The pale, necrotic area (infarct) at the lower right and the normal myocardium (upper left) are separated by asterisks. 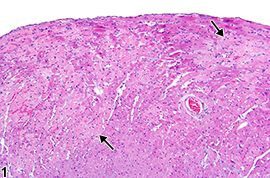 The peracute to acute stage of myofiber necrosis ( Figure 1 , Figure 2 , Figure 3 , Figure 4 , and Figure 5 ) consists of focal to multifocal hyaline, cytoplasmic eosinophilia of cardiomyocytes with loss of cellular and nuclear detail. A few marginating neutrophilic inflammatory cells may be present, and it may be accompanied by interstitial edema. Focal loss of preexisting fibers (i.e., myocytolysis) may also be present. 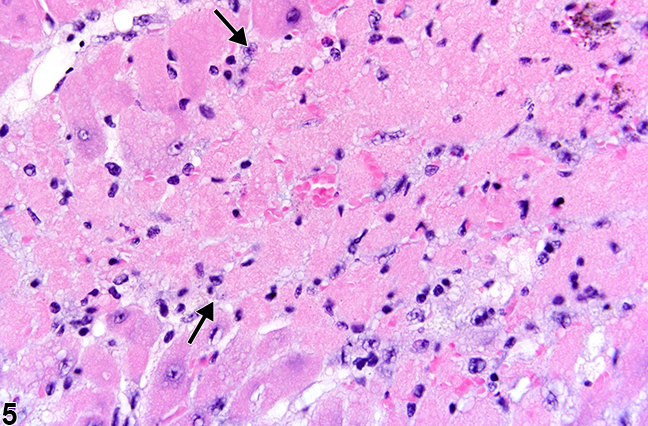 Within a few hours of initial damage, infiltration of macrophages digesting the necrotic myofibers may be present. With time, larger areas of myocardial necrosis become fibrotic. 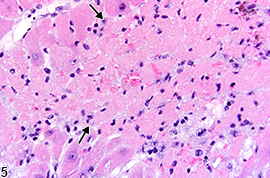 Necrosis can be one of the morphologic manifestations seen in cardiotoxicity (i.e., myofiber vacuolation, mononuclear cell infiltration, and fibrosis) or may be the predominant component in relatively early stages of spontaneous cardiomyopathy. 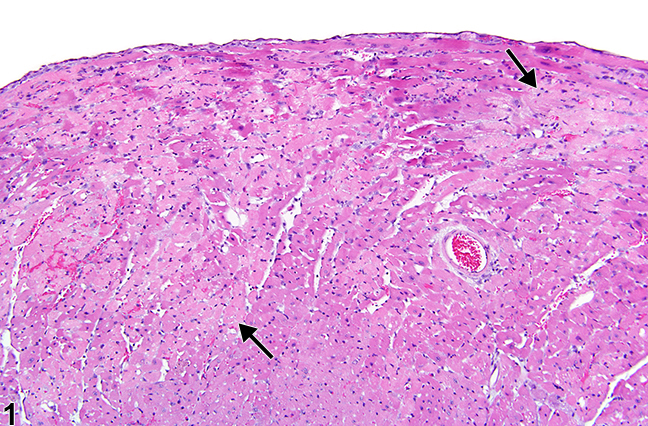 Necrosis may also result from ischemia (infarct); these areas tend to be larger and are typically well circumscribed ( Figure 6 and Figure 7 ). These lesions may have an inflammatory reaction at the margins and become fibrotic with time. Infarcts are caused by occlusion (e.g., by ligation or thrombosis) of a coronary artery that result in regional ischemic/coagulative necrosis of cardiomyocytes supplied by that vessel. The extent of the infarct is determined by the level at which the vessel is occluded, the volume of myocardium supplied by the vessel, and the collateral circulation to that region of the heart. There is no regional predilection for the formation of infarcts. Chemically induced models of heart infarction, without documentation of coronary vessel thrombosis, have been proposed in the literature. 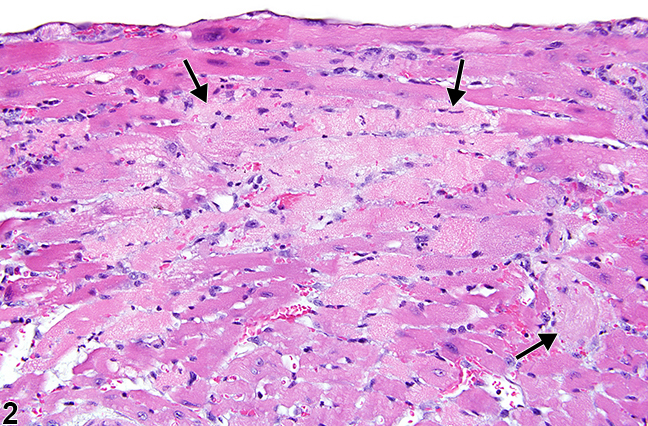 Heart, Myocardium - Necrosis should be diagnosed and graded if it is determined to be a separate entity and not part of cardiomyopathy. Necrosis should be graded based on the extent and/or number of lesions. 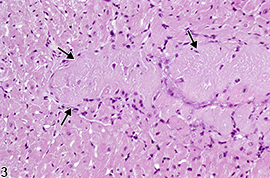 The distribution of the necrosis (i.e., focal or multifocal), as well as the location (i.e., right or left atrium; right, left, or interventricular wall) should be described in the pathology narrative. 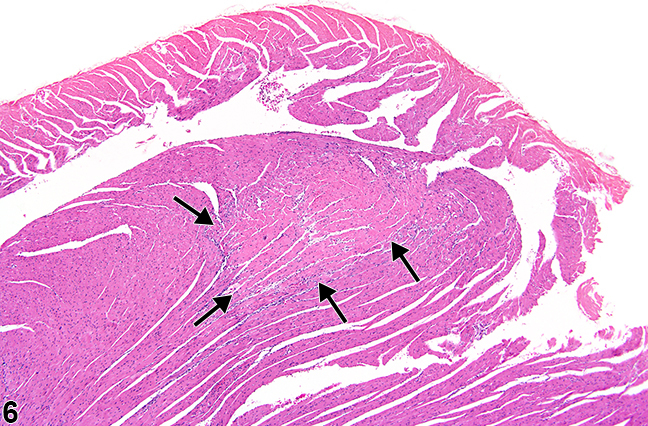 Infarcts should be diagnosed as necrosis, and its pathogenesis (i.e., ischemia) should be noted in the pathology narrative. If the necrosis is secondary to another lesion, such as inflammation, it should not be diagnosed separately unless warranted by severity. Likewise, lesions that are considered secondary to necrosis (e.g., inflammation, hemorrhage) should not be diagnosed separately unless warranted by severity. Elmore SA, Berridge BR, Boyle MC, Cora MC, Hoenerhoff MJ, Kooistra L, Laast VA, Morrison JP, Rao D, Rinke M, Yoshizawa K. 2012. Proceedings of the 2012 National Toxicology Program Satellite Symposium. Toxicol Pathol 41(2):151-180.